June 25, 1938. 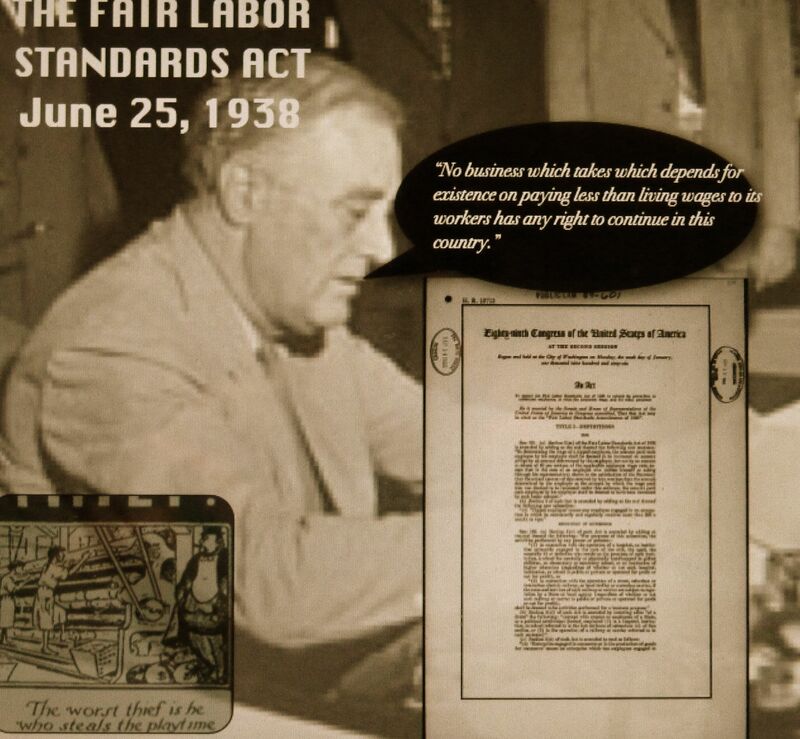 FDR signs into law the Federal Labor Standards Act. Back in 1974 I was an unpaid intern at a newspaper. This was an academic internship arranged by my college and for which I received college credit. Although I certainly provided valuable services for the newspaper, the primary reason I was there was to learn about the newspaper industry and see if it was something I might want to do after college. I learned a lot and found I loved the work. As it turned out, my internship led to my first post-college job because the managing editor of the newspaper where I applied for a job knew the managing editor at the paper where I had interned and the latter said some good things about me and I got the job. Because of my positive experience with unpaid internships, I encouraged my children to do them as well. They both did several unpaid internships in college. But unlike me, their college internships did not lead to paid jobs. Instead, they led to more unpaid internships. And that’s when I found out that not only are the drugs different now from when I was in college, internships are too. In the 21st century, American businesses have turned from being educational partners with universities to being exploiters of free student labor. Horror stories abound, particularly in the media industry, of young people forced to do menial tasks for free in the remote hope that having an internship on their resume will have some value to them. There’s no pretense of educational value other than learning how greedy and immoral American employers have become. The last time corporate America was this greedy was during the Great Depression of the 1930s. Workers provided services for pennies an hour and were happy to do it. But many fair-minded people in Congress were upset by the unfair bargaining position of employers over employees and they reacted with the Fair Labor Standards Act (FLSA). This landmark New Deal legislation set a minimum wage and also a maximum work week of 40 hours, after which a premium overtime wage was required.Corporate America accepted this new burden because there was a level playing field and all businesses employing U.S. workers had the same burden. In addition, many employers saw it as simply the right thing to do. Over the years, some businesses have become greedier and have tried repeatedly to work around the minimum wage laws. They have exploited every loophole (such as unpaid internships) and in recent years have even tried to have the FLSA repealed. My daughter worked for over a year for a large multinational corporation as essentially an employee without pay. It was called an internship, but there was absolutely no educational value and no connection with any educational institution. Clearly she should have been paid at least the minimum wage. Being on the right side of 50 gives you the ability to see trends over long time periods and the trends for employees are not good. Ever since Ronald Reagan broke the air traffic controller’s union in 1981, the balance of power has been flowing to employers. The minimum wage has stagnated and the number of unpaid interns has skyrocketed. Meanwhile corporate profits are at record highs. It will take decades to reverse this trend, but there’s something we need to do right away. We need to pay people in their 20s a fair wage for valuable work done for a business. We need to ostracize businesses that steal from young people by asking them to work for free. We need to have state and federal labor departments that vigorously enforce the state and federal minimum wage laws. We need to stop looking the other way and pretending these internships are bona fide. It’s the least we can do as parents and as moral Americans.